Data Chart organizing information related to plant growth at the end of week 2. 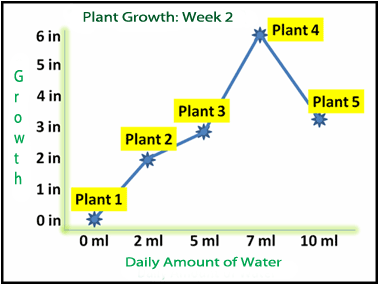 Graph representing the relationship between amount of water and plant growth. Before you solve a problem you have to have an identifiable problem. So let's create one! Always write out your problem in question form. Heidi wants to design an experiment about how much watering a plant affects plant growth. Problem: Does the amount of water affect the growth of bean seeds? Collecting information about a problem depends on whether you have basic knowledge about the problem you or trying to solve or not. In this case it may be useful to look up information related to plants and the environment. Looking at other research can help you make some decisions your hypothesis. Using an if-then statement helps to keep the hypothesis specific. The hypothesis also has to be testable. And most important, it has to relate to the problem. Hypothesis: If I water my plants too little, then they will not grow very much. In order to test this hypothesis, we need to design an experiment that controls certain variables. This makes it easier to identify the independent and dependent variables. We need a list of materials that will be used to test this hypothesis and the describe the environment where the testing will take place. 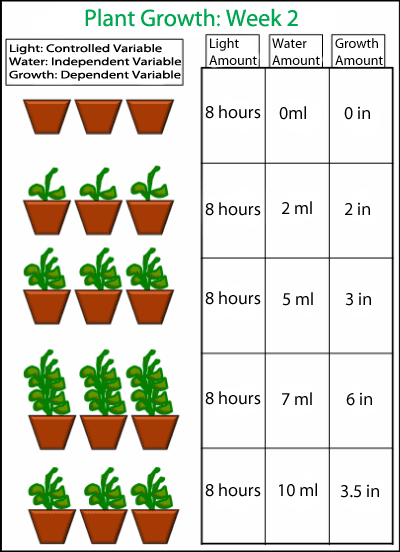 Below is the experimental design setup to test Heidi's hypothesis about bean seed growth and watering. The 15 pots will be divided into 5 sets of 3 pots. Each set will receive a different amount of water daily. These two steps are often done at the same time. While you are making observations daily, you should be recording the information in a way that it can be organized in a data table for analyzing later. Pictures, graphs and charts are ways to present your data for interpretation. 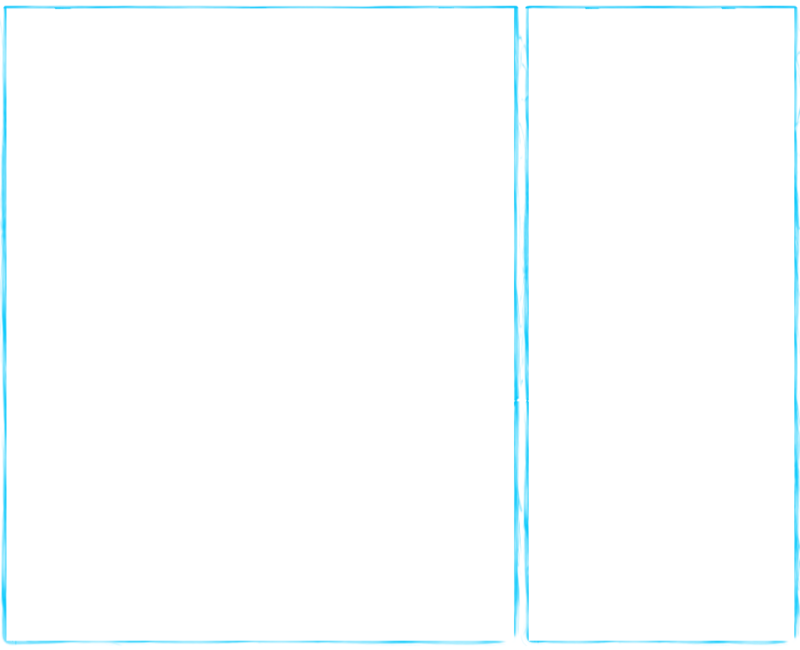 To the right are examples of a data chart and a graph. Based on the results of your test, does your conclusion support your hypothesis? If not, you might adjust a couple of things. You may change your hypothesis or make it more specific. You can run the test on the hypothesis again for validity. Or you could re-analyze your data to see if you overlooked something. All of these suggestions are useful, but may not all be used.